GALICIA TURISMO TURISMO DE GALICIA | Destinations | What is the Rianxeira? Sung at parties and celebrations, whistled or chanted in football stadiums and also in auditoriums …. The Rianxeira is possibly the best-known Galician song of all time, even more so than the Galician Anthem. The narration of its composition and premiere also links it to another phenomenon that is fundamental to understand the history of the Community: the emigration to South America during the first half of the twentieth century. However well-known it may be, the Rianxeira is not a popular song by an unknown author, one of those we have sung all our lives without being able to trace it back to its first performance. On the contrary, its immortal music was composed in 1947 by Anxo Romero Loxo, born in Rianxo in 1905 and who, by then, was living in Buenos Aires working in commerce. Romero Loxo was in his spare time an amateur jazz musician and member of several choirs founded in Argentina by galician immigrants. These groups were a sample of the cultural dynamism of Galician communities abroad and were, in many cases, linked to Galicianism. The composer knew, in fact, the artist and politician Alfonso Rodríguez Castelao, also born in Rianxo. In 1947 Castelao returned permanently from Europe to Buenos Aires, where he would die three years later. On the occasion of that return, the Rianxo Center of the Argentine capital decided to honour him with a song of regional style with lyrics related to the artist’s native land. Romero was commissioned to compose the music and he himself proposed writer Xesús Frieiro Dourado, nicknamed Pinciñas and descendant of rianxeiros himself. Frieiro researched as much as he could about traditional songs of the Arousa area and ended up writing a letter in honour of the patron saint of the town, Nuestra Señora de Guadalupe, the Virxe moreniña (brunette Virgin), in reference to the skin tone of the statue that represents her. The original title was Ondiñas da nosa ría (little waves from our estuary) and was premiered at Castelao’s welcome dinner. In 1950 the song was recorded in Montevideo and the melody became popular within a few years, thanks to its broadcast through the radio. 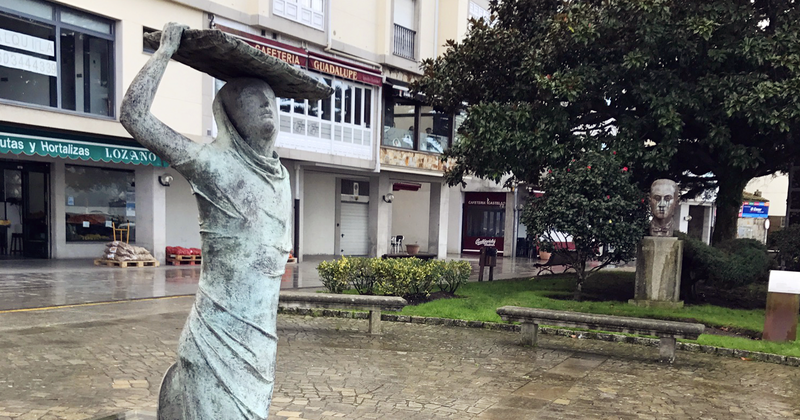 When its fame arrived to Galicia, the original verses of Pinciñas were transformed, incorporating other popular ones, to become the song we all know today: A Virxe de Guadalupe / cando vai pola ribeira / descalciña pola area / parece unha rianxeira. / Ondiñas veñen, ondiñas veñen / ondiñas veñen e van / non te embarques rianxeira / que te vas a marear. (The Virgin of Guadalupe / when she goes down the seaside / barefoot in the sand / she looks like a rianxeira. / Waves come, waves come / waves come and go / do not embark rianxeira / because you’re going to get dizzy). The Rianxeira is today one of those songs that can not be missing in any festival or Galician party. Football teams, including both Celta de Vigo and Deportivo de A Coruña, have used it, and still do, to celebrate their sporting achievements; the neighbours of Rianxo sing it in unison during the festival of the Virgin of Guadalupe; and its bars have been interpreted by singers and musicians as varied as Ana Kiro, A Roda or Linda Rondstad and The Chieftains. Anxo Romero and Xesús Frieiro also received recognition in their native town, where today there is a street dedicated to them by the sea and the local Cultural Centre.